Teak wood and polished concrete are harmoniously brought together in straight lines. 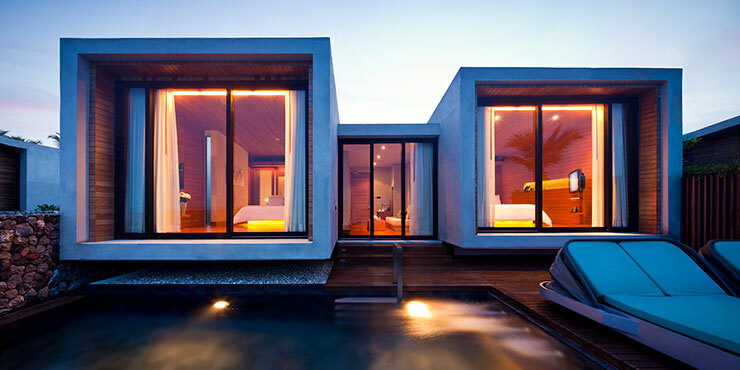 The extraordinary architecture created from minimalist concrete cubes makes the five star beach resort on the kilometrelong, fine sand Bang Niang beach into a distinctive design hotel. Inside, the architects have combined concrete, natural stone, wood and glass together in a way that is simultaneously rich in contrast yet harmonious. Thanks to GROHE Lineare, GROHE Allure and GROHE Tenso faucets for washbasins, showers and bathtubs, the guests experience the pure sensuality of the perfect flow of water. The outstanding quality, innovative technology and award-winning design of the GROHE products meet the highest expectations of the discerning guests.